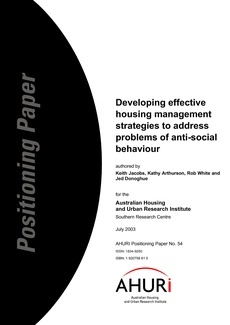 This Positioning Paper introduces research being undertaken by the AHURI Southern Research Centre to develop effective housing management strategies to address problems of anti-social behaviour (ASB). The research is premised on the assumption that public housing has, in recent years, become the tenure of the least well-off (a process known as residualisation). Residualisation has created a set of challenges for housing managers. In particular, deinstitutionalisation policies in health care have meant that many individuals, who would have been provided with institutional care, are now housed by public landlords. Housing managers are, as a consequence, increasingly expected to respond to complaints and resolve disputes between neighbours.